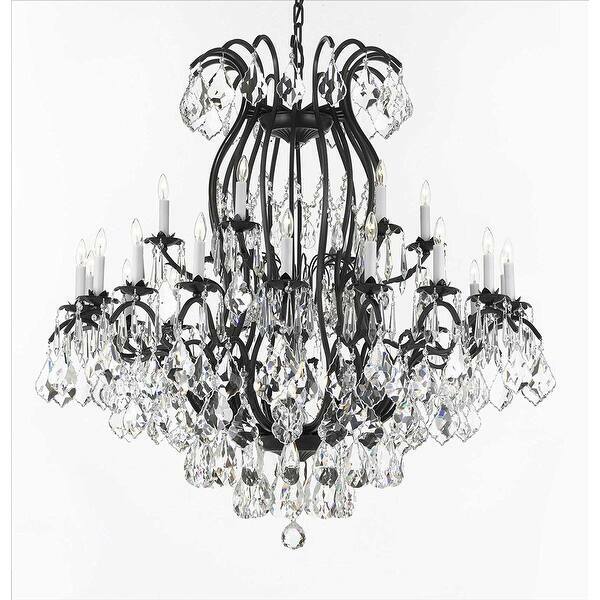 This beautiful Chandelier is trimmed with SPECTRA(tm) CRYSTAL - Reliable crystal quality by Swarovski elements! Swarovski elements is the world's leading manufacturer of high quality crystal. SPECTRA(tm) CRYSTAL by Swarovski elements undergoes stringent quality control and offers the best crystal for uniformity of sparkle, light reflection and spectral colors. A Great European Tradition. Nothing is quite as elegant as the fine crystal chandeliers that gave sparkle to brilliant evenings at palaces and manor houses across Europe. This beautifully unique version from the Versailles Collection has Crystal that capture and brilliantly reflect the light of the candle bulbs. The frame is all wrought iron, adding the finishing touch to a wonderful fixture. The timeless elegance of this chandelier is sure to lend a special atmosphere anywhere its placed! This item also works with energy efficient bulbs, halogen bulbs, compact fluorescent bulbs, LED bulbs etc (not included). Please note this item requires assembly. Please note, when you purchase an item from the Gallery you can be assured of the "Gallery 4 Points of Confidence": 1. Each item comes with a Certificate of Authenticity, certifying this product is an authentic Gallery lighting fixture. 2. Each item comes with a Gallery backed warranty (Established 1978). 3. Each item will include Gallery verified and approved diagram and instructions. 4. Each purchase is provided with a toll free number for free Gallery tech support. Requires (24) 40 Watt candelabra base bulbs (E12) - not included. Not UL. Dimensions 46.0 In. X 46.0 In. X 52.0 In.